Standard and Premium Content – What’s the Difference? We’re super excited to introduce a new “Premium” tier of content for those looking for more in-depth, highly researched articles. This gives you more options and also allows us to spend a little more time on topics that are research intensive. So, what’s the difference between the two tiers? We’ll discuss this in detail and also help you figure out which tier is the right choice for you. With Standard content, you will receive a unique and lightly researched article. All articles are still written by American writers, which means they will be grammatically correct. We still take the time to make sure that Standard articles are engaging and high quality. Many clients use our Standard content on their main blogs or “money sites” and have seen great results. Premium content is well researched, engaging and unique. We charge a higher rate for this tier, but this allows us to devote more time to the research and writing process. Twitter and Facebook posts are small snippets that you can copy and paste onto your social accounts to promote your new content. With Premium level content, we work with you to craft a post that really speaks to your readers. No matter whether you have an idea in mind or prefer to leave that up to us, we try to approach the topic from a different angle. Nobody likes to read the same story over and over again. That’s not what engages readers and it certainly won’t be getting the attention of search engines either. Shareable content is unique. It sheds new light on a topic or shares a completely new idea. This is what we strive to do with all of our Premium projects. There are also certain types of content that are only reserved for the Premium tier. Web copies and Press releases are only available on this tier. Let us explain why. Press releases and web copies take a great deal of time to create. This is especially true for sales copies. In order to create the best possible content, we have to take the time to get to know your company. We also have to take the time to get to know your products or services. How can we sell something we know nothing about? We also have to get to know your audience. To engage with them, we have to relate to them and really “speak their language.” A careful approach is taken with Premium content. For this reason, we only offer those two pieces of content at this level. If you choose standard content, does this mean that the quality of the work will suffer? Absolutely not! We are a small team of two writers who were born and raised in the United States. No matter whether you choose Standard or Premium, you will get high quality, grammatically correct content. The main difference between the two is the time spent on the research process. We do our best to go above and beyond for our clients, but there are some topics that require intensive research. Let’s say, for example, that you were interested in creating an in-depth piece on green energy. At Premium level, we can truly explore each type of energy in a more detailed way. We can talk about what wind and solar energy is, an in-depth look at how each one works, what benefits they offer, tax benefits (if applicable), ROI, environmental impact, etc. We can also take a unique approach to the topic by exposing myths of green energy or comparing studies. In short, we introduced a Premium tier to give you more options. The same quality that you’ve come to expect with our Standard articles will remain the same. Premium will simply give you the opportunity to add highly researched and in-depth content to your site. If you have any questions about our content tiers, feel free to send us a message or visit our FAQs page. Keyword Density – Why We Hate It! Google Hummingbird: What’s All the Fuss About? 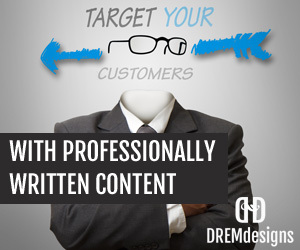 DREMdesigns offers professional article writing and content strategy services.